With Clooney, Pitt and Damon currently causing all sorts of havoc in Ocean’s 13, it’s worth taking a look at the team that started it all in the original Ocean’s 11. Frank Sinatra and his so-called Rat Pack were all in Las Vegas doing gigs along the strip when they decided to make a movie about stealing from the very mouths that were feeding them. 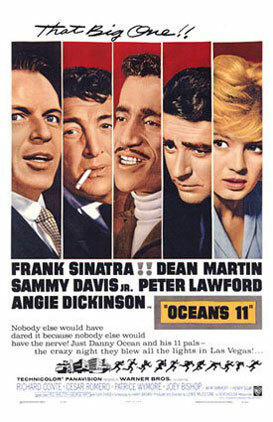 After performing at The Sands in the evening, Sinatra would turn around and, under the guise of mastermind Danny Ocean, shoot scenes about robbing it the very next day. Similarly, Dean Martin would entertain gamblers at The Sahara then break into its vaults as ex-paratrooper Sam Harmon the following morning. They were “liberating millions of dollars” from the five big Vegas casinos and having a ball doing it. This was back in the days when you could get a brand new car for ad-libbing a cameo role, as Shirley MacLaine did by appearing as the Tipsy Girl while simultaneously checking out her buddy’s live shows. Angie Dickenson scored a more substantial part as Danny’s wasp-waisted ex-wife Beatrice, and Erroll Flynn’s widow Patrice Wymore also signed up as his spurned lover Adele. Attitudes towards women in this film leave a lot to be desired; at one point Harmon says that he’d like to make them all slaves. And, indeed, the first two we meet are dutifully rubbing the shoulders of Peter Lawford’s character Jimmy Foster. This is a blokey romp that, unlike its contemporary counterpart, reinforces the notion that crime doesn’t pay. How could it when the casinos themselves were all in on the action as featured locations? Still, it’s fun to see how Vegas looked in its heyday with the men who helped put it on the map routing the very system at its heart.